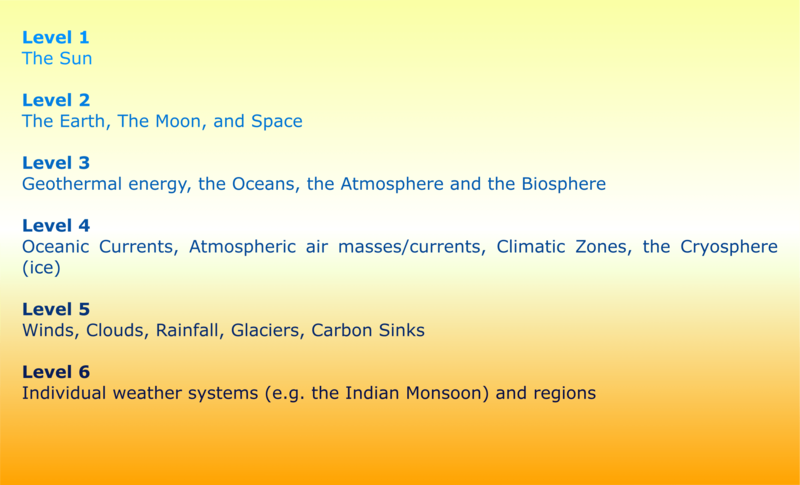 The Earth’s climate is an energy system, it is complex and adaptive. Sunlight arrives from our star, some bounces back into the coldness of space, some of the energy is trapped in the atmosphere and some in the oceans. That’s a very basic picture. A better view is to see the Earth’s climate as the product of a hierarchical system in which the various components interoperate, see Figure 1. At the first level, the energy of the Sun, our star, is therefore paramount, it is the source of virtually all of our energy, though the Earth continues to store the residual energy used in its creation in its core, in the shape of geothermal energy. The Earth, receives the Sun’s energy, and has an energy sink, the cold near vacuum of space. In addition, the Moon acts as a counterweight to the Earth, dampening its behaviour and regulating its tides. The oceans, the atmosphere, and geothermal energy, which provides a secondary source of heat, drive the reconfiguration of the land masses and sea-bed. The biosphere (living things) represent a third level within this system. As described in Figure 1, each level is dependent on the levels above it, and each level has dependent sub-systems. © Andrew Palmer, 2016, not to be reproduced.